It’s been some year for The Slow Readers Club. They finally released their magnificent second album Cavalcade, gained the support of 6 Music and XFM and are close to selling out a hometown show at Manchester’s Gorilla on 28th November. We caught them at Sheffield Corporation as part of their UK tour. There feels to be some sort of unstoppable momentum propelling The Slow Readers Club at the moment. In the past twelve months we’ve watched them blossom into one of Manchester’s most powerful live bands. Aaron Starkie has visibly grown in front of our eyes into a compelling front man, delivering his tales of wrought emotions, suppressed feelings and lost love with both intensity and emotion. His band mates, Kurtis Starkie on guitar and backing vocals, Jim Ryan on bass and David Whitworth on drums, provide the groove and the rhythm and the uplifting feeling that flows through each and every one of the songs they play tonight. A Slow Readers set these days feels like a greatest hits set because all of their songs have that scope, vision and reach that bands playing in arenas a hundred times the size of this tiny Sheffield room generate. They’re tailor made for bigger places than this yet retain a warm intimacy, lyrics that touch the hearts and souls of their listeners and the ability to sound big without sounding bombastic that so few bands can manage. You only have to look at the people around the packed room singing along to know that they’re touching raw nerves with them. They can even afford to not play songs of the likes of One More Minute and Fool For Your Philosophy that other bands would consider to be the centre point of their catalogue. Forthcoming single Plant The Seed has more of an electronic feel to it than the previous singles but it’s testament to the strength of their songwriting that their singles from Cavalcade – Forever In Your Debt, Start Again, Don’t Mind and I Saw A Ghost – have both an entwined connected feel to them but also demonstrate the diversity of their sound whilst album track Days Like This Will Break Your Heart, all clawing pent-up brooding retrospective regret, is probably the best of the lot. Not to be outdone, the two songs from their self-titled debut Sirens and Feet On Fire feel freed from the sometimes claustrophobic production of that record. They fittingly finish with Cavalcade’s closing track Know The Day Will Come where their vision becomes its most widescreen. 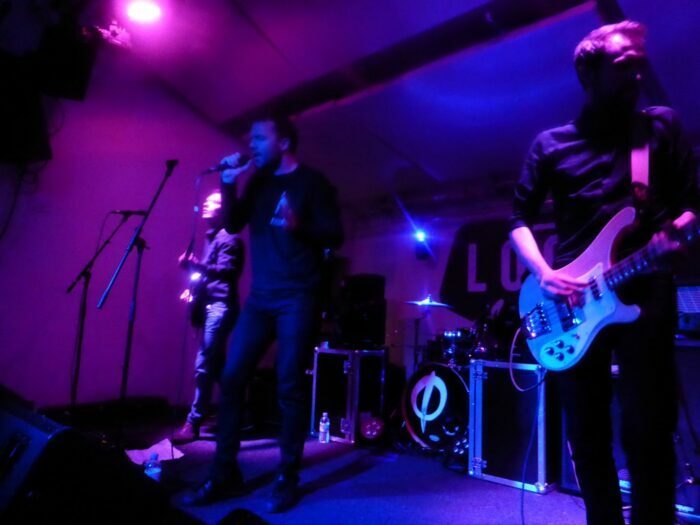 The Slow Readers Club are the best band you’ve never heard of. But once you have, you’ll find it impossible not to fall for them. The Slow Readers Club played Start Again, Sirens, Days Like This Will Break Your Heart, Don’t Mind, I Saw A Ghost, Forever In Your Debt, Plant The Seed, Feet On Fire and Know The Day Will Come. They can be found at their website. They are also on Facebook and Twitter. Their tour continues at Leeds The Pack Horse (Nov 20th), Liverpool Magnet (27th), Manchester Gorilla (28th), Preston Mad Ferret (Dec 5th), Glasgow The Classic Grand (12th). Couldn’t have put it better myself, they’re a real hidden gem!